Your English will improve if you speak or sing – out loud in English – to your dog. But also, have you noticed that when you go walking with your dog, other dog lovers will usually be more friendly? Maybe they’ll say hello, or ask you questions about your dog, or ask, “Can I pet your dog?” Use this as a great opportunity for some small talk – short, informal conversation. Remember – the more English you speak, the more comfortable it will become. Besides walking in your neighborhood, great places to meet other dog lovers (and for your dog, too) are parks in the area that are dog-friendly. 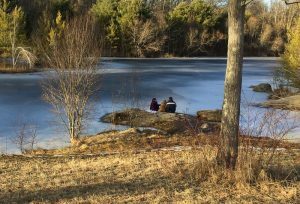 One of the best places is Eagle Pond at Callahan State Park in Framingham (shown in picture). Here’s a list of many more. Do you have another favorite place? This entry was posted in Learning Tips, Local Information, Speaking. Bookmark the permalink.